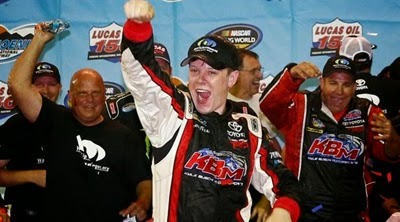 In a battle between two drivers who had never won a NASCAR Camping World Truck Series race, 17-year-old Erik Jones pulled away from Ross Chastain in the final 10 laps of Friday night's Lucas Oil 150, becoming the youngest winner in series history. On the last restart, we stayed with him through (Turns) 1 and 2 on the top side," Jones said. "He squeezed us up -- but that's racing with 10 to go. You can't blame him for that. But when something like that happens, it makes you more determined than you were before. I was really determined after that to go back and get it. I really felt like we had a better truck from the previous restart, and I really felt like it was our race all day and didn't want to let it slip away. Jones lost the lead to Chastain during pit stops under caution on Lap 89, the yellow flag necessitated by Ron Hornaday's hard crash into the Turn 4 wall. As soon as the green flag waved, however, Jones powered to the outside of Chastain after a restart on Lap 94 and cleared the No. 19 by the time the trucks exited Turn 2. Jones opened a lead of 3.2 seconds before debris from Joey Coulter's truck caused the fourth caution of the night on Lap 112. Chastain grabbed the lead from the inside lane after the Lap 120 restart moments before John Wes Townley's spin into the outside wall caused the sixth caution. Chastain held the top spot on Lap 134, when Timothy Peters' truck got loose beneath that of fellow Toyota driver Darrell Wallace Jr. and sent both trucks spinning.